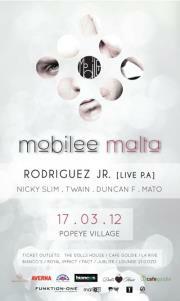 This March there is something to really look forward to, the opening edition of MOBILEE MALTA. Mobilee records launched in 2005 and quickly established itself as one of the brightest new stars within Berlin glittering galaxy of electronic music labels, producers and DJs. Founded and owned by Anja Schneider and Ralf Kollmann, the label boasts a sound that is simultaneously familiar and innovative. Rooted in the classic structures of house and techno, mobilee has harnessed the triple threat approach, its records reference vintage dancefloor minimalism, engage with like-minded contemporaries, and suggest surprising new directions for familiar forms. The cultural infused tantalising house event will take place on Saturday 17th March, 2012. MOBILEE MALTA is bringing a fantastic foreign act to Malta – Rodriguez Jr – who will be performing a live performing act amongst local talent Duncan F, MATO, Nicky Slim and Twain. This event will be dressed in cool and fresh house music, all done at an incredible location. This is one for the books and not to be missed.